Cedric is a Kenyan, born and raised in Monbasa (a small island along the East African Coast). He graduated from the University of Zimbabwe with a B.A. in Philosophy (first class). His commitment to issues of social justice especially for refugees and other marginalized groups has seen him work in Zimbabwe, Kenya, Uganda, and Tanzania among other countries. He helped found a community based organization that deals with protection of vulnerable women and children fleeing the war in Somalia. In Northern Kenya, he organized teen mothers to begin income generating activities. Cedric has also carried out researches that range from peace to food security in Kenya, Uganda, Tanzania and South Sudan. 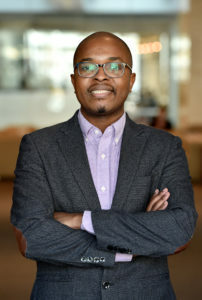 Between 2012 and 2013 he served as the Editor-in-Chief of Chiedza a philosophical journal that reflects on an array of issues in the global south. In 2013, Cedric Co-directed a TV series on peace and reconciliation. For the past year he was the Assistant Director of Advancement for a free high school for HIV/AIDS orphans. He hopes that these interests will see him through a joint degree J.D./LL.M in International Business and Economic Law. He is particularly interested in finding out how refugees and other marginalized groups can find a place in the global economy. With an interest international matters, Cedric is also a Global law scholar and Arrupe Scholar for Peace. In his free time he volunteers with Kenya Red Cross where he is a life member. He also enjoys early morning jogs (doing what Kenyans do best–run) and he is an ardent supporter of Manchester United Football Club. Over the years he has developed an interest in reading fiction. He equally relaxes by writing short stories.